Having made his way to the hearts of India Pakistan through 5 Bollywood movies, the soon to be released Kill Dil's killer is hosting Bollywood's first ever Box Office Awards on the 9th October. A collaboration between Star Plus and Box Office India magazine, Star Box Office Awards ceremony will recognize the achievements of Hindi films objectively, based on not only the business generated but also honor director, actors of the year with some interesting records set at the box office. The show will air around the festival of Diwali later this month on Star Plus. 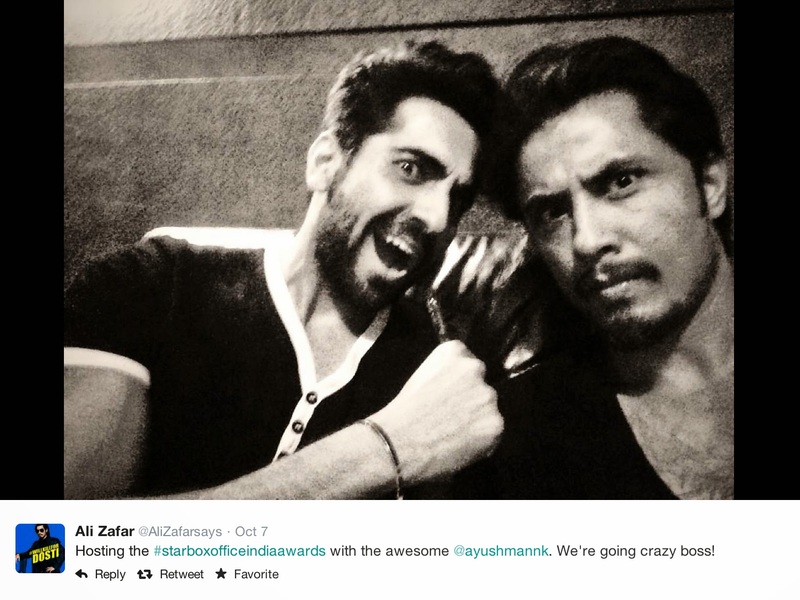 Ali Zafar will be hosting the big event with actor Ayushman Khurana of Vicky Donor fame. From closing the Myntra Fashion Week few days ago to being in the news for his action packed masala entertainer film promos of Kill Dil, October seems like the month of Ali Zafar. The actor who was the first one to prove in B-Town that Pakistani actors can have a viable career across the border, doesn't shy away from praising and promoting fellow Pakistani actors working in Bollywood. He's grounded and is there to support other actors who are crossing border to try luck in Bollywood. "Whenever i saw Fawad on TV, I always though he deserved much more. He has been projected well with his first project and he rightly deserves it. I want more Pakistani actors to come to India. The more that happens, more we'll be able to understand each other." On being asked about how he feels to be chosen to do the first ever box office awards in India, Ali said " I am really looking forward to the night. I am hosting the ceremony with Ayushman and he's a very cool, good natured guy. I like his bonding-in-the-moment sense of humor"
Calling show business a business of box office numbers, Box Office India publisher Nitin Tej Ahuja also told the media that box office collections are the most objective measure of the paying public's acceptance or rejection of films and the Star Box Office India Awards would honour the verdict of the actual film-watching audiences. Star plus General Manager Gaurav Banerjee is quoted as saying that it is the votes by people in the form of their hard-earned money which sets the box-office register ticking. often observed that small budget movies or the ones that may not do really well at the box office, win critical acclaim or accolades. It will be interesting to watch a judgment taken over movies that keep the box office collections in mind.